Original research and innovative programs take center stage in the fall issue of Ochsner Journal. From the laboratory of this issue’s Featured Contributor—Dr. George Pankey—comes “Colistin and Polymyxin B Minimal Inhibitory Concentrations Determined by Etest Found Unreliable for Gram-Negative Bacilli.” Because a reliable method of polymyxin B and E (colistin) susceptibility testing remains elusive, Dr. Pankey and his colleagues tested two techniques for determining colistin and polymyxin B minimal inhibitory concentrations. Their results demonstrate that broth microdilution—and not Etest—should be performed for susceptibility testing of polymyxins. Topics of the other four original research articles in the fall issue range from reducing hospital length of stay after total knee arthroplasty to a comparison of maternal mortality in Louisiana and Queensland, Australia. An article on Ochsner’s new state-of-the-art simulation center anchors the innovative programs offerings in the issue. This feature is particularly timely because the simulation center’s official opening and ribbon cutting will be held in early October. 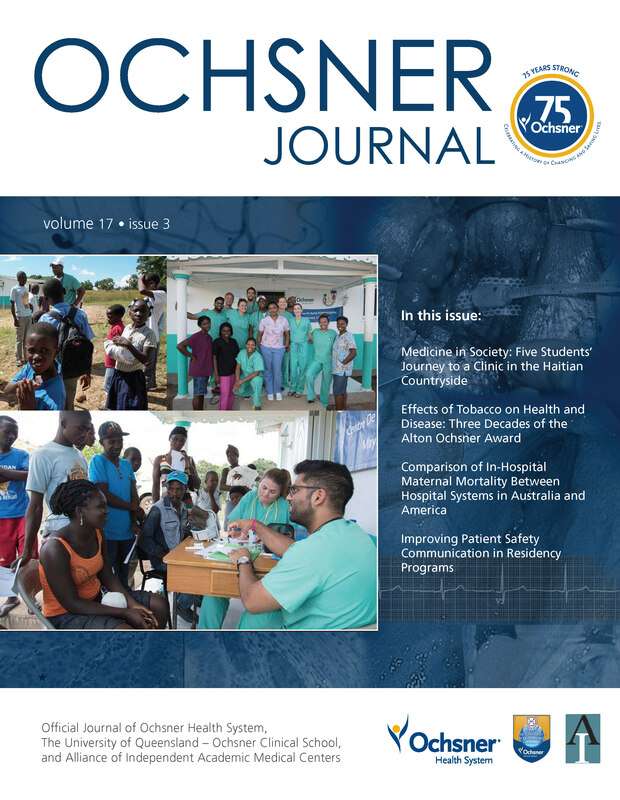 To subscribe to the Ochsner Journal electronic table of contents and to receive notification when each quarterly issue is published, complete this brief form.